Three fragmental templates, including 2,4-diamino-6-methyl-1,3,5-triazine (DMT), cyromazine (CYR), and trimethoprim (TME), were used to prepare the fragment molecularly imprinted polymers (FMIPs), respectively, in polar ternary porogen which was composed of ionic liquid ([BMIM]BF4), methanol, and water. The morphology, specific surface areas, and selectivity of the obtained FMIPs for fragmental analogues were systematically characterized. The experimental results showed that the FMIPs possessed the best specific recognition ability to the relative template and the greatest imprinting factor (IF) was 5.25, 6.69, and 7.11 of DMT on DMT-MIPs, CYR on CYR-MIPs, and TME on TME-MIPs, respectively. In addition, DMT-MIPs also showed excellent recognition capability for fragmental analogues including CYR, melamine (MEL), triamterene (TAT), and TME, and the IFs were 2.08, 3.89, 2.18, and 2.60, respectively. The effects of pH and temperature on the retention of the fragmental and structural analogues were studied in detail. Van’t Hoff analysis indicated that the retention and selectivity on FMIPs were an entropy-driven process, i.e., steric interaction. 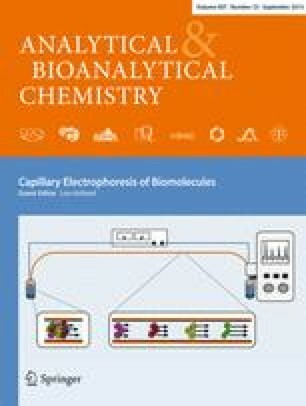 The resulting DMT-MIPs were used as a solid-phase extraction material to enrich CYR, MEL, TAT, and TME in different bio-matrix samples for high-performance liquid chromatography analysis. The developed method had acceptable recoveries (86.8–98.6 %, n = 3) and precision (2.7–4.6 %) at three spiked levels (0.05–0.5 μg g−1). The online version of this article (doi: 10.1007/s00216-015-8878-9) contains supplementary material, which is available to authorized users. This work was supported by the National Natural Science Foundation of China (Grant No. 21375096 and U1303202) and by the Hundred Talents Program of the Chinese Academy of Sciences.